The Perfect Addition To A Child's Birthday Party! If you are going to be gathering a group of 4 year olds together, you better be sure to have a way to occupy and/or entertain them; otherwise you will have your hands full of cranky kids. Playing some fun games with them is always a great option and certainly a must-have at birthday parties. To help get you started trying to figure out which games you might like to incorporate into your child's "soiree", here are some fun games for kids that I know my son found to be very entertaining when he was four. Some of them are also educational and they will invite the little imaginations to create and explore. FUN BALLOON RELAY RACE – This game is fun because it encourages teamwork. Have kids divide into teams, making sure you have even numbers on both teams if possible. Have kids get into pairs and then line up. Each team gets a balloon. Have a marker about 20-25 feet from the starting point. When the game begins, a pair has to take the balloon, put it between their foreheads and keep it there without using their hands, moving towards the marker and back to start as fast as possible without letting the balloon fall. Then they hand off the balloon to the next pair. The team that finishes up first will win. STOMPING BALLOONS GAME – You’ll need to have two balloons for every party guest and some string. Blow up the balloons and then use string to attach a balloon to each child’s ankles, so they have a balloon attached to each ankle. Once the game begins, kids need to move around trying to stomp on the balloons of other contestants, trying to pop the balloons. Meanwhile, they have to try to keep their own balloons safe from popping. When both balloons are popped, the child is out of the game. The last child to have an un-popped balloon is declared the winner. MYSTERY FISHING GAME – This is a fun game because everyone gets a prize. You’ll need to make a fishing pole with a stick, string and a clothespin as the “hook.” Use a table and cover it with a blue sheet or tablecloth, making sure the tablecloth hits the floor in the front. Have the “fish” sit underneath the table. Kids will “cast” the line over the table and the “fish” will attach a fun prize to the fishing line. Kids will enjoy reeling in a prize. SIDEWALK CHALK ART TIME – Have several buckets of sidewalk chalk on hand. Spend about 10-15 minutes outside, allowing kids to use the chalk to draw on the sidewalk. To add to the fun, you could make or purchase some stencils for them to use, they could trace each other’s hands or feet, or they could even draw fun portraits of each other using chalk. MYSTERY OBJECT GUESSING GAME – To play this game, you’ll need 5 items that have unique textures and a table. It’s best to choose items that kids use daily. Cover the items on the table so kids can’t see them before you begin the game and have the table in another area so the kids waiting cannot hear the guesses of the child touching the items. Using blindfolds, cover the eyes of each kid as they stand in line. One by one, help kids to the room with the table. Allow them to touch each item and make a guess, having someone record the child’s name and their answers. Continue this for each child. The child that guesses the highest number of items correctly will win the game. 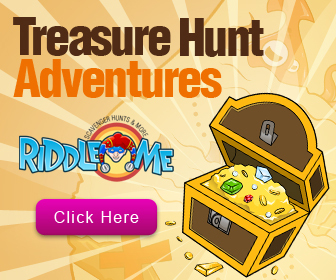 THEMED TREASURE HUNT – The best part about a treasure hunt is that it can be adapted to your specific party theme. Choose items that go along with your theme and hide them around the party area. For example, for a rubber ducky party, you may want to hide rubber ducks around the party area and have kids search for them to see who can find the most ducks. The child with the most items at the end of the search wins. You could also change up the game to have kids sit down after they find one item, that way everyone gets a chance to find one. If you choose this version, let kids keep what they find during the treasure hunt. FOLLOW THE LEADER – Have kids line up in a line, placing the birthday child at the front of the line as the leader. The birthday child starts moving and the rest of the kids have to copy those actions. For example, if the leader claps while walking, everyone else has to do the same thing. Have kids keep moving around the party area continuing to follow the leader. After a complete circle around the area, have the leader head to the back of the line and allow someone else to be the leader. Try to give everyone a chance to be the leader at this game. RED LIGHT GREEN LIGHT – Have all the kids line up across the yard or room from the one in charge of the game. There should be a nice distance between the game leader and the kids. To start the game, the leader says, “green light” and the kids are allowed to move towards the game leader (you can decide if they have to hop, crawl or run). As soon as the game leader says, “red light” the kids have to freeze. Anyone who doesn’t freeze is out of the game. The winner of the game is the child who is the last one standing or the child who finally makes it to the game leader. This game is so fun that you may want to play it a couple times so you have several different winners. CLEAN UP TIME! – Separate your game area using a jump rope. On either side of the rope, scatter 10-15 pairs of socks. Have kids divide up into two teams and have teams on opposite sides of the jump rope. Once you start the game, kids have to grab socks and throw them on the other side shouting out “Clean up time!” Give kids 5-10 minutes to play. The team that wins is the team that has the cleanest side at the end of the game. MEMORY ITEM GAME – For this game, you’ll need a tray and several household items, as well as a box that is large enough to cover the tray. Keep this game in a separate room so kids can do the game individually. When the first child comes into the room, uncover the tray for 30 seconds. Then, cover the tray again. Ask the child to name as many items as he can. Write down the number he gets right. Continue the game with the rest of the children. See who is able to remember the most items on the tray. The one with the highest score is the winner. FACE PAINTING – Kids always love face painting. Have some adults paint fun shapes on the kids’ faces or if you’re really brave, let kids paint each other’s faces with face paint. CAT’S TAIL CHASING GAME – You’ll need a roll of streamers for this game and some masking tape. Cut off a 2-3 foot piece for each child, attaching it to their lower back with a bit of masking tape. When the game begins, the goal is for kids to run around pulling off the “tail” of other players. The last one with a tail wins. DONUT EATING GAME – Take a long string and string on mini powdered sugar coated donuts. Tie up the string at just above face level, making sure you do this outdoors (it will be messy). Make sure that are enough donuts for every kid to have one. Have one child start the game. Place them in front of the string of donuts and when you say “GO” they have to eat one donut off the line. Time them. Have each child take a turn. See who has the fastest time and give them a small pack of the mini donuts as a prize. CLOTHESPIN DROP – All you’ll need a plastic milk jug with the top cut off, a sturdy chair and plenty of clothespins. Turn a chair backwards and on the other side of the chair, place the milk jug on the floor. Have kids climb on the chair and kneel, helping them if necessary. Then, give each child five clothespins and have them try to drop the clothespins into the jug without leaning over the chair. See which child can get the most clothespins in the jug. If several kids score the same number of points, have a challenge round to get a winner. LINE UP BY HEIGHT GAME – This game doesn’t require any props, so it’s an easy one of the easier games for 4 year olds. Divide the kids up into two teams. Then, when you say go, the goal is for kids to arrange their team into a line from tallest to shortest. You may want to demonstrate the idea before the game begins to help kids out. The team that lines up by height the fastest (and correctly) wins the game. BALLOON FUN - Have some blown up balloons available for play. The object of the game is to not let the balloons hit the ground. You can pair the kids up and give each pair a balloon or throw several balloons into the air. The kids then have to keep hitting them up into the air and to one another to keep them from falling to the ground. BALLOON BADMINTON - pair up your players, give everyone a badminton racket, and 1 blown up balloon for each pair. The object of the game is to keep the balloon from touching the ground by hitting the balloon back and forth. CAKE-WALK WITHOUT THE CAKE - Place numbers on the ground in a circle, place these same numbers on individual pieces of paper into a bowl, and have everyone stand on a number in the circle to start the game. Play music, have kids walk around the circle until the music stops, at which time each child must get onto a number. Draw a number out of the bowl and whoever is standing on that number is the winner. EGG RACE - Have everyone line up with an egg on a spoon. On "Go," everyone races to the finish line. The object of the game is to cross the finish line first without dropping their egg. If they drop their egg, they must pick it up and place it back on the spoon and resume the race. MUSICAL CHAIRS - Set chairs in 2 rows, back to back using 1 less chair than the number of players. Turn music on and have everyone walk around the chairs. When music stops, everyone sits down. The child left standing is out of the game. Repeat until only 1 child remains and they are the winner. PIN THE TAIL ON THE DONKEY - Hang a picture of a donkey on the wall. Make your tails out of card stock or construction paper. As each child takes a turn, blindfold them as long as it doesn't freak them out, give them a spin, and let them see if they can give Mr. Donkey a tail in just the right place. To make it easy, you can use double-stick tape on the tails. Whoever pins their tail the closest to Mr. Donkey's hind quarters is the winner. RING TOSS - nail 6" long dowels into a piece of plywood in 4 rows of 5 evenly spaced. Set plywood on top of a card table. Give kids various sized embroidery hoops to toss over the dowels. Based upon the hoop size, you can give out different point values for each hoop that rings a dowel. SIMON SAYS... - Birthday child starts the play as Simon and everyone must do what Simon tells them to do when asked with a phrase beginning with "Simon says." If "Simon says skip", the players must skip; if they don't they are out. If Simon just says "skip" without saying "Simon says", the players should not skip; those who do are out. It is Simon's goal to get everyone out as fast as possible. It is the players' goal to stay in as long as possible. NURSERY RHYMES - No need to just limit your activities to games, you might also want to consider including a few nursery rhymes. Ring Around the Rosy and Mary had a Little Lamb have always been favorite games for 4 year olds. A few rounds of these rhymes are sure to bring giggles and smiles to your little youngsters. If you're thinking about adding some printable party games to the mix, here are several options to check out that would be fun for your little 4-year-olds to play. Games for 4 year olds are a perfect way to make a great party even better. To keep your sanity in check, be sure to have enough teen helpers or moms and dads at the party to assist with the games, snack time, and just good ole keeping an eye on little ones who might enjoy a bit of mischief! Just remember that 4-year-olds can have a short attention span so you'll want to be sure to provide variety to keep the kids engaged and you'll ultimately end of hosting one grand event! Fun Games For 4 Year Olds! Share your fun ideas for games for 4 year olds. This will give other site visitors an opportunity to use your ideas to help them create a memorable and fun 1st birthday.